The high point of an emotional week for our family was seeing my niece Mandy Poulter and her husband Matt reunited last night with their daughter, Maya Esther, at an orphanage in Haiti. 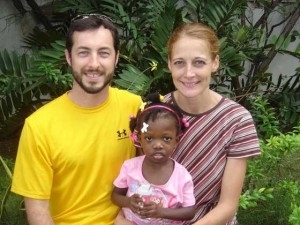 Since I blogged last week about how an ABC News crew and Good Morning America anchor Robin Roberts found Maya uninjured at the orphanage, efforts turned quickly to bringing her home. Sen. Tom Harkin’s office and the U.S. Embassy in Haiti expedited paperwork to get her a visa to enter the United States. After a three-year adoption process in Haiti, Maya was legally Mandy and Matt’s daughter, and when the earthquake struck last Tuesday, they were waiting for her U.S. passport and planning to bring her home to Pella, Iowa, in February. Once they knew the visa was approved, Mandy and Matt flew into the Dominican Republic, then entered Haiti on a helicopter bringing supplies to ABC News crews. At last report, they were waiting for a flight home. We’re hoping to get the joyful news today that Maya is on her way home to Pella. On Good Morning America Tuesday, Mandy was on the phone live from Homestead, Fla. Not only did they get Maya, they were able to bring home four other orphans being adopted by other families in Pella. They made it home Tuesday night. You can watch the reunion on Nightline or this morning on Good Morning America. Steve, I am so happy for your family. God bless you all. I read the story of your niece and her husband being able to bring Maya home, plus other children needing homes. WHAT A GREAT STORY!!! It brought tears to my eyes to watch the reunion. I do not even know the family, but it was such a beautiful reunion. My best wishes for the new family/families as they begin their lives together. I couldn’t agree more. This was a most wonderful story during the Haitian tragedy. May the Poulter family have much joy with their “new” daughter, Maya Esther.